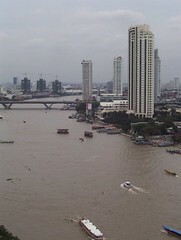 the swash register: Finally....a picture of Bangkok. Originally uploaded by swash buckler. Quite a few of you asked me to post a picture of Bangkok. So here it is. This is the view from the hotel room I was staying in. Kind of strange how this is very similar to the view I had from my hotel room in Tokyo the week after my trip to Bangkok. Next: View from the Tokyo hotel.